Black Gold Farms invites you to grow with us! At Black Gold, we strive to provide our employee’s work with a purpose. We recognize that our operation relies on many skilled and talented individuals doing many things right to successfully grow, harvest, sell and distribute our crops throughout the United States. We work on the farm, in the field, at the office and on the road. We do what we can to be good stewards of the land, good community members and good industry partners. Here at Black Gold Farms, we work hard to ensure that each person that is a part of our team is offered: an opportunity to grow personally and professionally, rewards that include more than earning a salary, impactful work that matters, a culture that includes being a part of our family and values that extend locally and globally. Black Gold Farms is a fourth-generation, family-owned business founded in 1928 that today operates on a national scale, growing the nation’s best potatoes on nearly 25,000 acres spread across 11 farms in 10 different states. We’re a leading supplier of chip potatoes to America’s largest snack companies, and a growing factor in the fresh sector where our focus is on red potatoes and sweet potatoes – two types that continue to show positive growth as consumers strive to eat healthier. Our culture places a very high value on honesty, authenticity, and service – we say what we do and do what we say. We strive to ensure a family atmosphere and to maintaining a positive employee environment for learning and innovation, with an emphasis on generating greater returns through teamwork powered by skilled and committed individuals. We embrace sustainable practices while producing the highest quality with the lowest costs – not by cutting corners, but by working smarter. 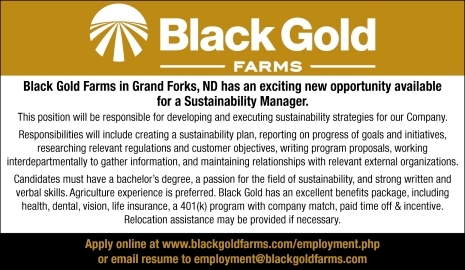 The Sustainability Manager is an exciting new position available with Black Gold Farms in Grand Forks, ND. The position has been created to develop and execute sustainability strategies to position us as a leader committed to sustainability in the agriculture industry. Creating and executing a sustainability plan. Identifying key performance indicators and goals for the plan and reporting regularly on the progress towards these goals. Work with senior leadership to create and communicate the vision of the sustainability program both internally and externally. Research sustainability related issues that may be related to government, industry, or customer interests. Drive sustainability projects by researching their feasibility, ROI, and impact. Serve as the point of contact internally and externally on all matters regarding sustainability. Effectively communicate and maintain relationships with these parties. Create and conduct training to help promote a culture of sustainability and educate fellow employees. The ideal candidate for this position will be someone who excels at interacting with others, is a natural leader, teacher, and change champion. They must have a passion for the field of sustainability, possess excellent written and verbal communication skills, and a hold bachelor’s degree. Black Gold has an excellent benefits package, including health, dental, vision, life insurance, a company funded health savings account, short term disability, critical illness insurance, accident insurance, a 401(k) program with company match, paid time off, paid holidays, retirement bonus, and an incentive bonus. Relocation assistance may be provided if necessary.